April issue on sale today, online and in store! | What Hi-Fi? April issue on sale today, online and in store! The magazine's had a makeover this month, with a new, improved Buying Guide – containing 1500 products in 36 updated categories with revised tech specs – and a special, 16-page Ultimate Guide to Tablets. Our Buying Guide now contains the best four- and five-star products (as well as our Award winners, natch), plus tips on how to pick the perfect TV screen size for your room, set up a Blu-ray player and choose the right headphones. What's more, we've tested every tablet, large or small, that we could get our hands on in a mega round-up of these high-tech marvels. Whether you want to watch blockbuster movies on the train, access a world's worth of music or remote-control your house, a tablet will do it all. We help you decide which one is best for you. 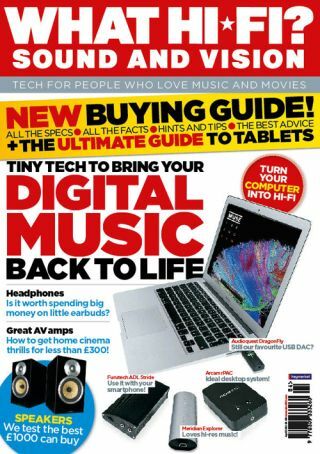 Elsewhere in the issue you'll find all the usual hi-fi and home cinema loveliness. Got all your music stored on a laptop or PC? Then don't mss our Supertest of USB DACs, the perfect way to turn your computer into a proper hi-fi. The Award-winning Audioquest DragonFly takes on newcomers from Meridian, Musical Fidelity and HRT, among others. For those who like to listen to their music on the move, our round-up of £125-£200 in-ear headphones brings you a choice of the best models on the market. Of course, no issue of What Hi-Fi? Sound and Vision would be complete without some proper hi-fi, and this month's issue won't disappoint. Our Group Test of stereo speakers is aimed squarely at those looking for an upgrade – we've pitched top brands from £700-£900 against each other in a six-way shootout. Elsewhere you'll find our verdict on the latest version of Quad's legendary electrostatic speakers, the gorgeous ESL-2812s, a minimalist pre/power amp combo from Heed Audio, Pioneer's £800 A-70 stereo amp and a pair of powered speakers from Roth Audio, the OLi POWA-5s. Home cinema fans fear not: we have an exclusive First Test of Yamaha's exemplary RX-A1020 AV receiver, the Cambridge Audio Azur 752BD universal disc player, and the most luxurious TV we've seen in ages, the Bang & Olufsen BeoVision 11-40. Oh, and did we mention a trio of sub-£250 home cinema receivers from Pioneer, Sony and Yamaha? It's amazing how much surround sound performance (and features) you get for your cash these days. All this and more is packed into the April issue, on sale now in store, online and available to download from iTunes directly to your iPad, or for non-Apple users via Zinio. Happy reading!